Some brands have a way of coming back into your life after being away for a long time. 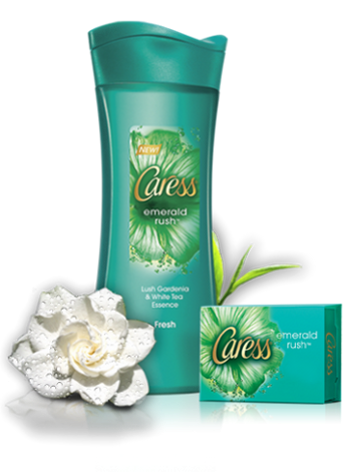 Caress is one of those brands. As a child, I remember the beautifully carved peach colored bar of soap that had a soothing and seductive smell leaving my skin soft and smooth. I thought I was a woman, using the same grooming products as my mother. I remember the commercials of attractive cosmopolitan women working out, doing their makeup, heading out for a night on the town and even though the most exciting thing in my 8 year old social life was gym and recess I aspired to live that life all through a bar of soap. Fast forward to present day and a recent care package from Caress arrived at my door and all those memories came flooding back. Now I'm in my own home, in my own bathroom, that I have made into a luxury retreat. Every shower, every bath is a way for me to pamper myself and begin my day in the most simplest form of being fabulous. Whether it's a bar of moisture rich Caress Soap or the soothing scents from the shower gels, I start everyday feeling fabulous. So folks, what makes you fabulous every day? Join me on Twitter @ShopEatandSleep and use the hashtag #CaressMe and tell me how you do you put a fresh and fun spin on everyday life?